The Radio Operators Of South Texas ARC will be operating a special event station at Beethoven Maennerchor celebrating 150 years as a German singing society in San Antonio Texas. Location at Beethoven Maennerchor 422 Pereida St. (King William area) every Saturday in September from 9a.m. to 9p.m. Dates Sept. 2,9,16,23,30. Open to everyone, even if not a ham! Operation will be in 14.255+or- and on 146.860 repeater (123.0 tone). Certificate will be rewarded to all contacts made via SASE return mail. March 15 is the designated birthday of The American Legion. It is the day in 1919 when the first American Legion caucus, held by members of the American Expeditionary Force, convened in Paris. Much as the birthday of the United States is celebrated on July 4 – for the day in 1776 when rebelling patriots declared the independence of the British colonies and the spirit of America was born – March 15 is the day on which the Legion came to life. Each year, Legion posts across the country hold events – public, private or both – to commemorate this anniversary. At the National Headquarters of The American Legion there also is an event conducted annually to observe the Legion birthday, and on a worldwide scale. Members of The American Legion Amateur Radio Club (TALARC) will operate a special event station to commemorate the Legion’s 98th birthday. Operating from the radio room at National Headquarters in Indianapolis, ham radio operators at club station K9TAL will celebrate the Legion’s 98 years of service to America’s veterans with both members and non-member amateur radio operators around the world on Saturday, March 11, 2017. Ham radio operators wishing to contact Special Event Station K9TAL should tune to 40 meters: 7.225 MHz (+/- 5 KHz) LSB; or to 2 meters: K9DC 147.315 Repeater at Indianapolis; or IRLP Node 9735; or, to EchoLink *CROSSRDS* Conference node. All operations will be conducted on Saturday, March 11 between 1 p.m. and 7 p.m. Eastern Time [1800Z to 2359Z]. All amateur radio operators are invited to check in. American Legion posts with TALARC stations are encouraged to check in from around the country. Membership in The American Legion Amateur Radio Club is free to all licensed radio amateurs who are current members of The American Legion, American Legion Auxiliary and Sons of The American Legion. Learn more at www.legion.org/hamradio. American Legion Legionnaires will honor their fellow veterans in a special on-the-air amateur radio tribute on Veterans Day, Friday, Nov. 11, 2016. Members of The American Legion Amateur Radio Club (TALARC) will operate on the short wave bands starting at 9 a.m. through 4:30 p.m. EST [1400 – 2130Z], using the call sign K9TAL. Any ham radio operators who contact the station are eligible to receive an attractive full-color commemorative certificate. After working K9TAL, send a 9X12 inch self-addressed stamped envelope to The American Legion Amateur Radio Club, 700 N. Pennsylvania Street, Indianapolis, IN 46204. Friday December 5th 6:00 p.m. to Saturday December 6th 6:00 p.m. We still have multiple slots open for this event. Especially 10:00 p.m. Friday to 6 p.m. Saturday. All license classes invited to participate. Hill Country REACT will be operating a special events station at the 2011 AREA 20 Special Olympics Spring Games. The guest operator will be W2IK, who will concentrate on 40 meters, around 7.270 MHZ from about 9AM until he poops out in the afternoon. Feel free to work this station, send a QSL card and a SASE to the QRZ address of K5HCR, since this is the callsign he will be using. Guest ops are welcome to join in at the operation: Location is in Schertz at the Samuel Clemmons High School at the athlete village. If you hear us, work us and please post on the cluster! Back in 2006, we made over 130 contacts in 4 hours. Help us break that record. 2010 Skywarn Recognition Day – On The Air! 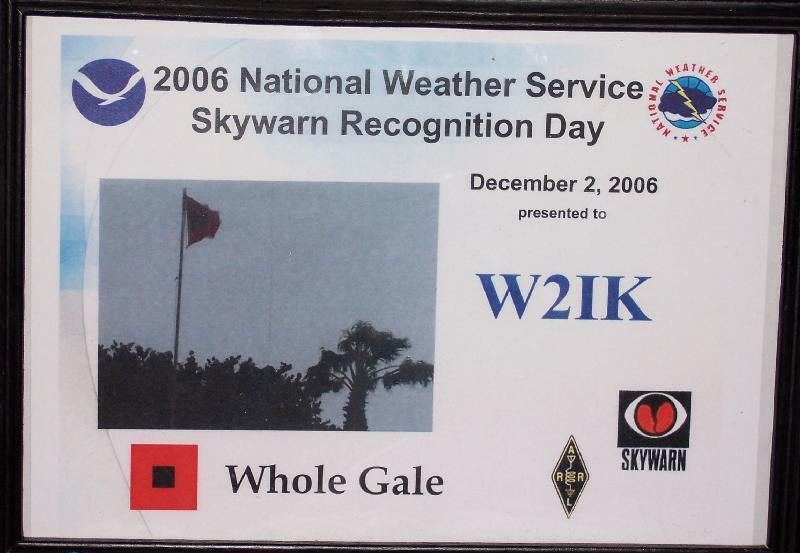 SKYWARN Recognition Day was developed in 1999 by the National Weather Service and the American Radio Relay League. It celebrates the contributions that volunteer SKYWARN radio operators make to the National Weather Service. During the day SKYWARN operators visit NWS offices and contact other radio operators across the world. In other areas of the country, check with your local National Weather Service office to see if they are participating in this event or having an “open house”. It is not a contest, but rather an operating event. Amateur radio operators will be on the air from National Weather Service offices and from their home stations as well. Depending upon how many NWS stations a ham operator contacts they will be given certificates of varying levels. The certificate (shown to the left) was given to W2IK in 2006 for contacting over 40 different NWS stations all across the US. Be a part of this fun event by either visiting your local NWS or by making contacts with as many stations as you can. At this site, you can get a list of participating NWS offices, their call signs, and other useful information. Check this site often as additional participating offices will be listed as the day approaches. I hope you’ll join in on the fun and learn more about the National Weather Service and the function Skywarn plays in keeping the country safe during severe weather conditions. Last year, we made 360 contacts from our site which was a major increase from previous years. This year, we want to break that record. Contact Louis to join us or go on the air from your home station to work us. April 10, 2010 – Noon until all the antennas and equipment are stowed. Come to the Medina County Rest Stop; U.S. Hwy 90, approximately 40 miles west of the Loop 410 and Hwy 90 intersection; approximately 7 miles west of D’Hanis. On board was a crew of seven: Colonel Rick Husband; Lt. 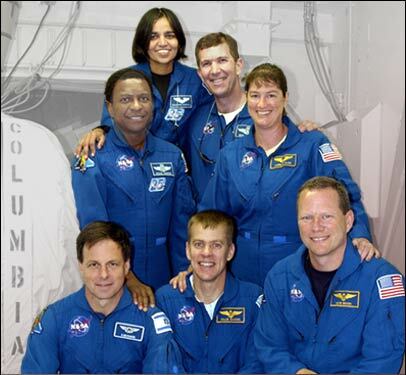 Colonel Michael Anderson; Commander Laurel Clark; Captain David Brown; Commander William McCool; Dr. Kalpana Chawla; & Ilan Ramon, a Colonel in the Israeli Air Force. The Nacogdoches Amateur Radio Club will again hold a special event station in remembrance of the shuttle disaster on Feb. 1, 2003. The event will occur on Saturday, Feb. 6, 2010. Ham operators from other areas are welcome to attend the event. If you cannot come to Nacogdoches, we would like to hear from you on 20 or 40 meters. Operation will begin at 0800 CST (1400 UTC) and end at 1500 CST (2100 UTC). The station will be set up at the McMichael Middle School located at 4330 SE Stallings Drive in Nacogdoches. This is on Loop 224 between Hwy 21 east and FM 2259. The event commemorates how the ham radio operators from the local area went into action immediately after the shuttle crash to provide emergency communications and relay traffic necessary to the coordination of the event. Within hours, ham operators from across the state of Texas and other states as well also became involved. Many ham radio clubs sent members to assist in providing communications for the varied search teams. Other clubs provided towers and repeater equipment necessary to relay vital information.